72045T is rated 1.9 out of 5 by 16. Convenience just got more convenient. Touch it on. Touch it off. Or go completely hands-free. Tap anywhere to start the flow of water or use the Hands-Free Technology option. Your entire Touch2O.xt™ Technology soap dispenser acts as a sensor so the soap starts flowing instantly and effortlessly. It senses your presence within 4 in. and automatically shuts off within seconds once you remove your hands. Rated 1 out of 5 by Jbird97 from The Soap Waster This thing keeps shooting soap across the countertop for no reason. It will not shut off. Our builder talked us into putting this in and we regret it. 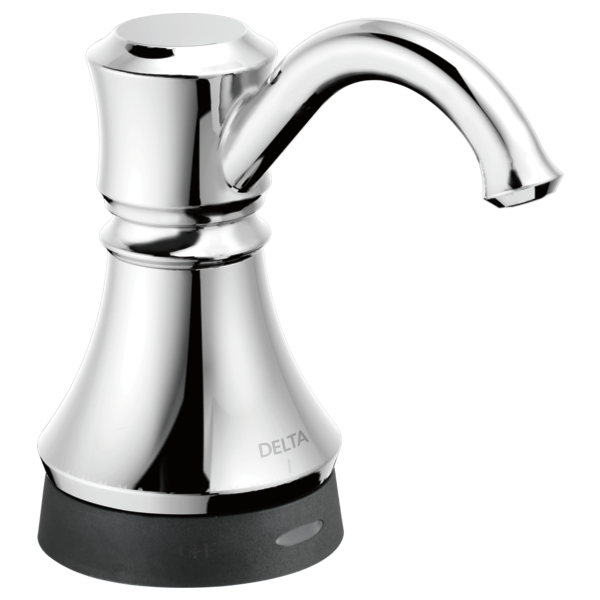 Rated 2 out of 5 by Perplexed from Not Pleased Purchased the Delta 9178T SP DST faucet and the Delta 720445T-SS in September of 2018. Love the Faucet but the Soap Dispenser has never worked right. I have changed the batteries several times even though I knew that was not the problem. The mechanism that holds the batteries is a piece of junk. I have even cleaned the dispenser out several times but nothing works. So trash can here it comes. I hate doing that because it matches my faucet. But the aggravation is not worth the matching. Delta what do I do? Rated 1 out of 5 by eeeric from Touch intermittently works We have had this installed for about 6 months and we immediately configured it to not utilize the motion sensor and only use touch. Unfortunately, the touch has been horrible. Sometimes, we can't get it to work at all so we now have a manual pump sitting right next to it. Also, it randomly goes off wasting about half or more of the soap in a full reservoir. We own a touch faucet and love it, why doesn't this work just like that does? Rated 1 out of 5 by Disappointed from It worth buying Redid kitchen and was excited about this product. This is the third one delta has sent us and they only last a few months. Just my husband and I so no abuse involves. Almost seems like motor is not big enough to push the soap out. Can’t believe delta would put out such a poor product. Beware. DO not buy!!!!!! I can not be more serious about how how bad this product is! Rated 1 out of 5 by Miller Time from Must be the worst item in Deltas product list. About two years ago we remodeled our kitchen which included this soap dispenser. It was installed by a master plumber and worked fine for about 5 months. After that it began dispensing soap for no apparent reason and wouldn't dispense soap when used as per the instructions. I contacted Delta about the problem and was sent a new dispenser, had the same plumber install it and it worked fine for 4 months, then had the exact problems as the first dispenser. I contacted Delta again and was sent a third dispenser. I had the plumber install it and it worked fine for a few months then had the same problems popped up. I then purchased a manual dispenser. The replacement dispensers were sent to me at no charge but I had to keep paying the plumber each time he came to the house. My total out of pocket cost was nearly $500 for the plumber, plus the cost of the first auto and the manual dispenser. . Rated 1 out of 5 by deannashue from Wish I never bought these! Sadly I have two of these and they are equally awful! As others have mentioned, the sensor will sometimes dispenses soap for no reason at all yet when you want soap you touch and touch and touch but no soap! So frustrating! Refilling is even worse which seems like I have to do all the time because it wastes so much soap. I turn it to the off position (red light) yet it still dispenses soap while it is being refilled! If you accidentally overfill or get any soap on the sensor, which is nearly impossible to prevent, it will dispense soap non stop until you unplug it. If you attempt to touch it to put in the purple mode (to change the amount of soap dispensed), it dispenses soap! The sensor on my main sink now seems broken and will not even recognize the off mode at all so we have to unplug (which is so nearly impossible for me to do) to refill or watch half a bottle of soap go down the sink to refill. They are less than two years old. Can they easily be replaced with a manual pump? Rated 1 out of 5 by madison999 from Problematic dispenser We just cleaned up a big mess under our sink, because the container that holds the soap broke off and coated everything in the cabinet with a thick layer of soap. The dispenser never really worked consistently. It looked nice, but we're done with it. Rated 1 out of 5 by Bama Girl from Disappointed Could not get dispenser to work after adding soap... thinned out soap with a bit of water after reading trouble shooting - not made for hand soap apparently. Worked for about a week. Even thinned soap will not come out, though pump sounds like it’s working. So disappointing. I regret spending my hard earned money on it. How do you increase the amount of soap dispensed? Can a power adapter be used rather than the Battery pack on the soap dispenser . I use the 9volt power adapter for the Faucets. Can I use 'foaming' soap for this dispenser? &nbsp;It is thinner and tthought it might be better. Can this dispenser be used if you turn the sensor off. In other words, can you get soap out of it when the sensor turned off? If so, how does it work? What size hole must be drilled in granite counter top for installation of this dispenser? What material is this made of? Thank you.